John Lennon's Monkey Bike Is Up For Sale . Beatles Radio: The Beatles, Solos, Covers, Birthdays, News The Fab 4 and More! John Lennon's monkey bike is set to go up for sale later this year. The rare item was bought by the Beatles icon in the late 60s, and features in a number of iconic photographs. The motorbike - pictured above - was used by John Lennon for getting around his Tittenhurst Park estate in Surrey, where he lived from 1969 to 1971. The Honda Monkey/Trail Bike XUC 91H will go up for sale through H&H Classics on March 4th, and is valued at around £30,000. 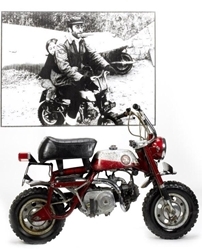 The Honda Monkey/Trail Bike XUC 91H will be sold through H&H Classics at the National Motorbikes Museum on March 4th.